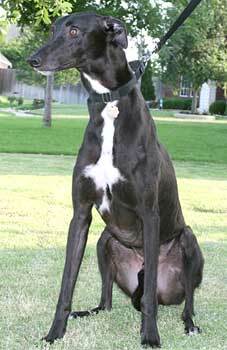 Rudy, aka Roto Wag, is a handsome 2-year-old, born March 28, 2005. 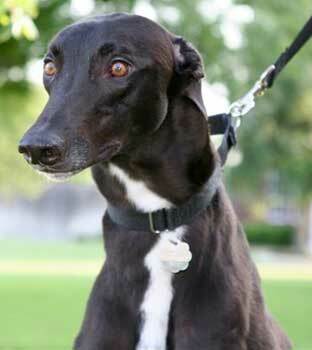 He made a greyt showing his first couple of races, then decided he just wasn't THAT into racing. His dam is Unruly Midgee, and his sire is Splishin Vallie. 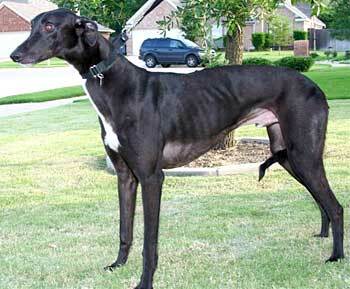 His great-grandsire is Rooster Cogburn, who was a champion racer back in the late 1970s. Rudy is ready for his new career: bringing love and happiness to a forever home. No cats, please! He's waaaaay too interested. He hasn't been tested with small dogs at this time. Rudy is awesome! He is about the longest pup I have seen-- he is very sweet with a gentle demeanor. Although we have had him only a few days, he seems pretty laid back, starting to smile and he has a girly sweek to his bark -- but don't tell anyone that because we have to keep up his mystique. He is getting along great. He's a tall boy so the counters are tempting but we will work on that. He slept through the night without any accidents and no accidents in his crate. The other greyhounds in the house don't seem to mind having another foster. We'll send an update after he's settled in a little more.